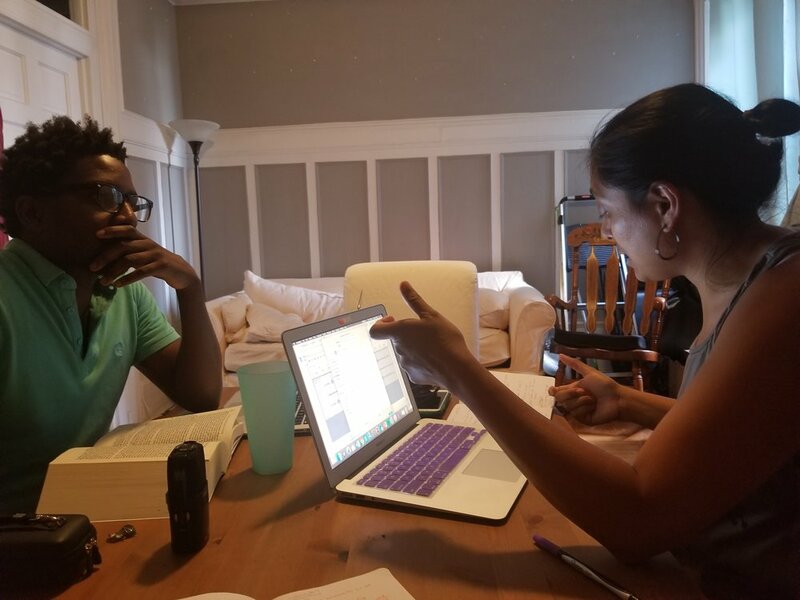 In this episode, we speak with Dr. Rochelle Gutiérrez about rehumanizing mathematics. As a professor at the University of Illinois at Urbana-Champaign, she engages us in a discussion on her works in Political Conocimiento for Teaching Mathematics (2018), in Living Mathematx (2017), and on creative insubordination. AD: And so much more. LS: We are here. Where is here? Where is the here? Where are you? AD: I'm in my apartment. I'm in my apartment. Where are you? AD: We're here on online, here. LS: So, last episode we introduced a new segment, our go-to segment. We're going to continue that before we delve into the episode. Okay, Atasi, I'm going to give you two options. LS: First option, okay. You can choose one that we'll talk about for our go-to. What is your right now, your commute? We're in New York City, we spend a lot of time on delayed trains with signal problems, and yeah, that's what we do. What is your go-to song or music that you vibe to on your commute? Or, What is your go-to song as like when you get off the subway and you are walking to your place or whether you're going to teach, whether you're going to school to do your research? What is that song that is like, okay, I got this, I can do this? Those are your options. AD: For the commute or ... but I do have a response. I mean, I love listening to podcasts just to keep me occupied as I'm walking through the city, but if I'm trying to move from one place to another in the gym, I listen to, I love Shakira, yeah. I'll listen to this genre of music to just ... that's upbeat. That's me, I'm that person you're like, "Give me these options." I'm like, "No, I go with Z." LS: Yeah, you ... that was not. You threw out a third go-to, which is ... what is it? Your go-to gym song. LS: Okay, yeah. Yeah, alright. Took us somewhere different. AD: I did. Yeah. It sounds like maybe you have a go-to to share of your commute because you have quite a commute, right? LS: Yeah. Thank you for not asking the gym, currently I'm not working out. AD: No worries, no judgment. LS: What am I doing? What's your question? AD: What is your go-to when you're trying to get from point A to point B on the subway? LS: Okay. When I'm actually on the subway, if I'm not reading, which right now I'm reading Octavia Butler's Pattern Master series, which you didn't ask but I'm telling you anyway. I'm listening to Be Steadwell who makes ... she pens her music as music for queer people of color and it is really good. It's really nice to just vibe out especially in the morning when the trains can be really hectic and people are really antsy and anxious. It's really good chill music. AD: Nice, awesome. That's cool, I like it. Cool, so this past couple episodes we have been talking a lot about science and praxis. This episode, we're going to be talking more about mathematics specifically. And so, when I think of mathematics, there's just this giant looming thing that is like, ah mathematics. Toya, for you when you think of math, what does it bring up for you? What do you think about? What's the first thing that comes to your mind? LS: PSA, all those teachers, we have calculators on our phones. I have a calculator all the time. Yeah, math is always, it's either something that you get or don't get. Some math I got, and some math I definitely didn't get. Calculus was really hard, geometry not so much. Then when you think about how math is used in science, like physics with all of the math that you use and even in bio when you're doing ... not titrations, dilutions, it's really hard and I think it trips up a lot of people. I will speak from the I, sometimes it trips me up on just having to think about doing math. AD: Cool, yeah. I mean, I think that's a common ... it's interesting that you brought up the differentexamples of taxes. Hey, where in my everyday life. Cool. LS: I think between the two of us, I think of you as the math person. I'm always like, oh I dodecolonial approaches to science and science education. A little bit of math, I draw in some math people. Atasi, Atasi's really the ... you should talk to Atasi about math. She's doing really awesome things with numbers, talk to her. Sort of to me you are the math person. AD: Hilarious because yeah, I don't necessarily ... I am interested in thinking of the discipline of mathematics and I also teach math. There's things that I think I agree with you, my experience is like some things I feel more comfortable with and other things I have to work a lot harder. Sometimes I'll keep working and I still won't get it. As your resident, but I think I'm going to not even take that on, a math person. I think a lot of people have that same notion of either identifying themselves or someone else as a math person, or a non-math person. 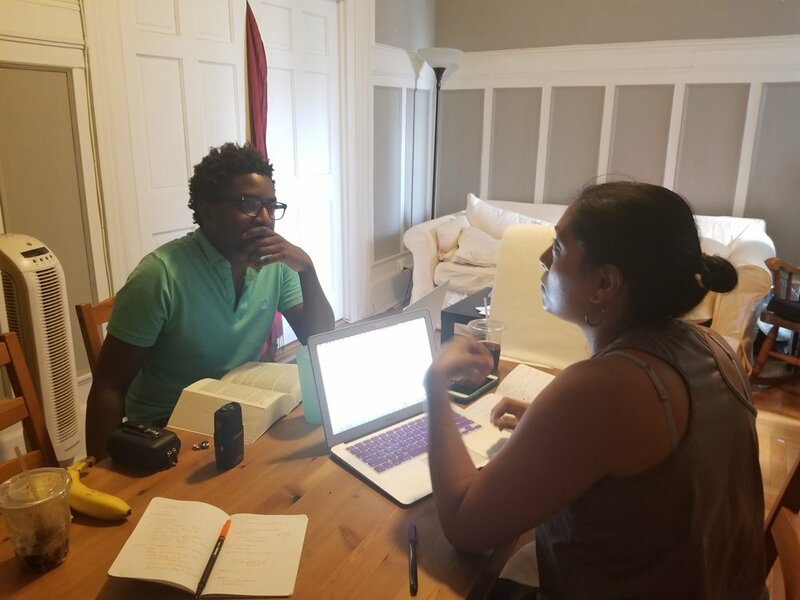 In this episode we're going to be talking with Dr. Rochelle Gutiérrez about her ideas and her work in challenging that assumption in the first place, not even having a scale of you either are or you aren't. We are just being, you're just a human being. We're going to talk to her about her work on re-humanizing mathematics. Toya, can you tell us a little bit more about Dr. Gutiérrez? LS: We're very lucky to have been able to chat with her. Her work is super dope. 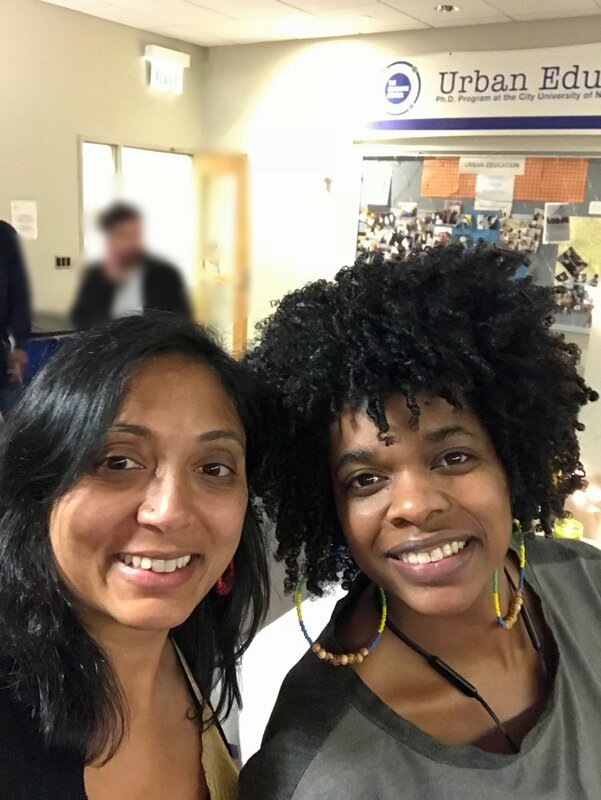 Dr. Rochelle Gutiérrez is a professor of mathematics education and Latino and Latina studies at the University of Illinois Urbana-Champaign, which is about what, two and a half hours south of Chicago. AD: Yeah, I think so. LS: Her scholarship focus on equity issues and mathematics education. She pays particular attention to how race, class, and language effects the teaching and learning of math. AD: Great, so let's listen in. AD: Great, so thank you so much for being on our show today. So, Dr. Rochelle Gutiérrez is with us to talk a little bit about her work and some ideas around math. We like to ask all of our guests before they come on to maybe share with us, what are you listening to currently? Dr. Rochelle Gutiérrez [RG]: Currently, as in right now I wasn't listening to anything. I was listening just before this to a song by Zeshan B. It’s called Brown Power. He's an awesome musician who kind of blends, and this is going to sound like an interesting mix, kind of blends Indian, Pakistani, old film music with Chicago blues, with soul. RG: He uses a harmonium when he performs. And having a husband who is Indian, and having respect for tabla and the sitar, and other instruments that I think much more difficult to use, it's amazing to watch him in concert using this harmonium, which is basically like a wooden box but like an accordion as well. Maybe there's also like the ... having spent a long time in Chicago, there's that attraction to the Chicago blues, there's the soul. Maybe the harmonium is reminding me of my Mexican ancestry in terms of how the accordion was used and that, I don't know. It's a great upbeat song, Brown Power. RG: It's great because in his concerts he sings it and then it's a call and response. Then the audience is screaming back, Brown Power. Then he sings something, and then you sing, Brown Power. It's powerful. RG: You know, I don't even know if it's on his new CD. I have it bookmarked. I saw him in concert here in Champaign because they make his harmoniums here in Champaign. RG: I just have it bookmarked on YouTube because somebody filmed a concert of his and I have that song. I think he's putting it on his new CD but I don't know that it's available by iTunes potentially as a single song. I'm not sure. AD: Okay, okay. Cool, well thanks for sharing that. LS: Yeah, and could you also tell us where you're calling from? RG: I'm calling from Champaign, Illinois, which is about three hours south of Chicago. LS: Great, thank you. I just want to reiterate the appreciation that we have for you for being on our podcast. I think up until this point, aside from Atasi, most of our guests have talked specifically about science. We're really excited to delve into math on its own. I guess we'll get right into it and talk about this notion that you put forth, this idea that all mathematics teaching is political. Could you explain to us and our listeners why this is so? that ‘Oh My God’, people can unpack all this complex stuff that's happened years before us, and they've got archival data. Give that kind of sense of intelligence to people who do these other kinds of things when there's many things that are very complex and require a lot of different lenses and a long time to understand the nuance and the uncertainty. We think somehow mathematics is this special thing. I think mathematics teaching is political because teachers are always helping develop the identities of students in relation to mathematics and because they're always positioning students as either experts or not, and not to create a binary as in you're either doing one or another but you're always producing and reproducing what mathematics is. Then also producing and reproducing whose good at mathematics. What is this thing called mathematics? Who is it by? Who is it for? Who gets credit? All of that kind of stuff is part of the politics, it actually permeates out into society so it's not even just what decision do you make about assessment is political. My distinction is that mathematics teaching in particular is political, even recognizing that all teaching is political. AD: Yeah, it's so interesting that you share in such a full way, kind of a distinctness to how math teaching and math education plays out in schools. I kind of wanted to ask a little bit more about that math education or mathematics confers this reverence, like you get those two reactions and the idea that the person whose "good" in mathematics has a certain command of complexity. I've been thinking of what brought me into questioning mathematics and having a different stance to it is recognizing how folks who might not be given that adulation. For example, my grandmother or women I've met, lots of different people I've met who are handling family, handling children, handling the business of the day. Everything, right, all at once. There's so much uncertainty in the world around their social conditions and they're doing all of this. They don't have a math degree, but they're able to show really ingenuous and creative ways of navigating life. I wanted to maybe get your thoughts in how that might relate to the second point that you bring up of the re-humanization of mathematics. To me, when I hear you talk about the reverence that's given, it's kind of like a dehumanizing aspect because it's not given for everybody but if you could speak more to how that might connect to a need for re-humanization of mathematics. RG: Yeah. I used to talk equity and I've kind of shifted into talking about re-humanizing mathematics because the equity language just isn't working for me anymore. I talk about re-humanizing mathematics. That re part is really important because I know a lot of people are starting to talk about humanizing pedagogies or humanizing education, and humanizing methodologies in education. I'm connected to those people but I say re-humanizing in mathematics because we're all already innately mathematical. It's not until we go to school that we're taught that we're no longer mathematical. Everybody, humans and actually living beings are mathematical. For centuries, we've been doing different forms of mathematics. Like you say, our mothers. Every time a mother is putting away leftovers, there's amount of spatial reasoning, and thinking about volume. Other dimensions, when people are juggling all those different schedules, that's kind of multiple systems analysis. When women are braiding each other's hair and they're thinking about at what angle to take the next braid, or the next row. When Latinx mambo musicians are coming up with different beats and riffs, they're figuring out least common denominators. There's all kinds of work that everyday people are doing but you get into school and you're told you need to show your work in this way or it's not real mathematics. You need to be able to come up with the most general case, which means you need to develop the equation that's going to model all versions of this rather than thinking about, well in this context this particular algorithm is going to work for me. We don't even think about social algorithms. The fact that you're at a stadium and somebody stands up next to you and lifts their arms, and you know, oh this is that wave. You stand and you lift your arms, and the next person lifts. That's a social algorithm, those people are doing mathematics in a stadium but we don't call it mathematics because it's not sanctioned in a way that's reduced to this very dense symbolic form that says I can write it in a way that's recognizable, and it's sanctioned by mathematicians. Then I think you have to go back to the question of, well then who are the mathematicians that are sanctioning this? Who gets to decide what counts as mathematics? For me, the re-humanizing part is saying that it's not like we need to create something new in some respects, it's really that we need to bring back that which has been erased through schooling. If we can support people to keep doing many of the things that people actually do naturally, and then help then extend that and make it even broader, that all of that should count as part of mathematics education. LS: I thank you for that. In some of the examples you gave when you were speaking about that were all innately mathematic, you brought up examples from very specific cultures. In your re-humanization of mathematics, you talk about centering Black, Indigenous and Latinx students in this process. Can you speak about why we need to center these particular students in this process of re- humanizing math? RG: Yeah, I mean I think if you want to radically reimagine something you don't start from the group that the system's already working from. If you're in a business and you're thinking our product doesn't seem to be working, you don't start with the people it's working for and go have focus groups and ask them, "How would you improve it?" You go to the groups that aren't using it, you go to the groups that the system is failing and you say, "What is limiting about this form of mathematics we're doing in school that's dehumanizing for people?" " What needs to be brought back?" "What are we missing?" I think by centering Indigenous communities and communities that are Chicanx or that are Black, then you're basically saying these are the people that are going to be able to tell us what's wrong with the system. you know it's science, technology, engineering, mathematics. We could reframe that and say, "Actually, the reason people are not staying in these fields is because these fields don't allow us to be whole, and to thrive, and to flourish, and to remake ourselves as Indigenous people or as Black communities, or as Latinx communities." I think when we think about how can we re-humanize mathematics we have to center those very populations that the system has failed. AD: If you could speak to more of what you mean by a social algorithm. Maybe this can be connected in some way because I've never really heard that term or just how to even imagine it. There's this interaction between ... I don't know, if you can speak to more about what you mean by a social algorithm. RG: Sure. I mean, I think of a social algorithm as an algorithm is just okay, what are the rules that we're going to follow, what's this game that we're going to play. In some ways, almost like a formula. If the rules of the game are that as the person next to me is starting to stand, I'm going to follow that, I have to read everything in some ways in that body. It's not reduced to a set of rules like ... I mean, people aren't in their heads thinking. Okay, the person is about three quarters standing, I think now is about the time I should stand. Now my knees should be at a 45 degree angle and then as I extend up and it gets to 180 degree angle I'm going to be fully, and my arms will extend. It's not that. It's almost like there is some programming to it in the sense of how we think about algorithms in schools. How would you perform this algorithm? What would I do with the different variables that I have? The social part of it is that it's also read through the body and it's read through being in connection to ...through the body, and it's read through being in connection to other people, almost the way murmurations of starlings work, where every starling bird is only paying attention to closest six starlings, but when you watch them move as a flow, they're perfectly in synchronicity, right? And each one of those starlings is in some ways following an algorithm. That algorithm is, "I'm trying to get as close as I can to the next six birds, but to be closest to this bird means that I'm getting further away potentially from that bird. So I'm constantly making these adjustments." So in some sense, there's no single algorithm that's causing that murmuration to happen, or that when we're socially engaged in something what that algorithm means, and yet it is the things of mathematics that an algorithm is a formula or a program of what to do, given the situation. Here's the rule that we follow, is basically. I'm not sure if that's making sense, this is the first time I'm talking about that in particular, so I’m probably not very articulate about it. AD: No, I really appreciate just the term itself and thinking about it, because when you are speaking right now it makes me think of mathematics as being a really individual activity, but it's actually a social one, in that it's a living process. So, I'm like, "Wow, yeah." All the different examples that it's adaptive in a way, and so it's not so static. I mean, that's what I'm taking from it, I'm not sure if that is precisely what you mean, but it just makes it more dynamic to me. RG: And I think that's what gets lost a lot of times in school mathematics. I think when we go back to that idea, well who is the system working for and who is it not? Many of the students who are feeling like, "Why would I do this thing? It has nothing to do with me. I have more pressing concerns in my community, the world is already not set up to benefit me and my people, so why would I go through this set of what feels like arbitrary rules that someone else is coming up with?" That just, in many ways, mathematics serves as a form of preparing citizens for compliance, because once you go through sitting in classrooms for 12 years of compulsory mathematics, completely removed from anything that's of real importance to you and your life, you're being taught and then you're told that people who can sit through those classrooms, and who can produce those abstract reasonings are seen as intelligent. Then, you're left with not a lot of resources to deconstruct that or to challenge that. So then you're left with either, "Well, these rules must make sense to other people and I just don't get them," and then you're potentially in a position in society to defer to these other people who seem to understand the rules, who seem to understand the algorithm and a way that doesn't make sense to you, and for doing this number crunching completely absent of ethics, or community purposes, or it almost seems like the more removed from humanity you are, the smarter you are. We see this even in terms of mathematicians in math departments, you know, the ones who think of themselves as being pure mathematicians, as in, "I don't work in applied mathematics. I work in eight dimensional space. I play with things that don't exist. I don't worry myself about what's happening on the ground on earth." So that even that sense among mathematicians, and of course I'm stereotyping, I have friends who are mathematicians who are amazing, amazing mathematicians, and they don't operate in that way, but many, many mathematicians kind of protect this form of mathematics that is dehumanizing. LS: Yeah, and this, I think, beings us to another point that we really wanted to delve into with you, which is you and others in the field have written and theorized about reconsidering the very definition of mathematics, especially when you talk about bringing back that which has been erased, and then who are the people who gets to decide what counts as math. So can you talk to us about how mathematics is defined in that definition, what needs to shift? And sorry, three-part question, and that shifting, how do we bring back that which has been erased? Like how do we remember these things that have existed but have gotten pushed away? RG: Okay, I'm going to try and answer that, and please remind me of parts that I've forgotten, because there was a lot in that question. So what I heard you saying was the reconsidering the very definition of mathematics, I'm going to start there. Yeah, I'm not alone in being the only person to say this, but I think that we miss the mark when we don't start by first interrogating what even is mathematics? And I think this maybe goes back to the comment that you made earlier about the social algorithm part feels like it's very dynamic, and it's community driven, and it's moving. Mathematics is a human practice, it's a practice of living beings, and so first of all, we need to redefine it from being a noun to being a verb. We have to recognize that it's something always in motion, and that it's something that we are constantly creating and tearing down as we move through this world. between that, and I can recognize that animals, and plants, and bodies of water have teachings to offer me, and mathematical teachings to offer me. So I think one of the things I've written about is a term called 'living mathematx' and it's written like 'mathematics' but without the I-C-S, it just has an X on the end, and in that paper I talk a little bit about what that X means, because it means many things. But when I say living mathematx, I recognize that we are both living a version of mathematics, but we also are that living version of mathematics, and that relates back to Nahua metaphysics, which recognizes that we are at one with the cosmos. So when I think about redefining mathematics, I come back to indigenous principles I was raised on, and those are In Lak’ech, reciprocity, and Nepantla. So the Nepantla gives it that uncertainty, the messiness that we were talking about earlier, that things aren't these really clear cut binaries, and think that mathematics often is in the service of protecting binaries. We say a number is either even or odd, we say a number is either rational or irrational. In some ways, we say people are either woman or man, or we say that you're either human or you're not, and as soon as we get those binaries we start to create hierarchies that justify that some people are more deserving of respect in this world than others. So I'm going to try to get at that part of what gets lost. So one of the things that gets lost, again from an Indigenous perspective, knowings, and I say knowings instead of knowledge, because knowings, and knowings is always plural for me. Knowings is always plural because knowings are always in relation to others. So I alone can't have a knowing that's just me, it's always in relation to others, but those knowings are always systems. I say knowings instead of knowledge because knowledge to me feels very static, so I'm saying indigenous knowings to highlight the fact that this is always ongoing performance, but from that perspective indigenous knowings are always systems. They're systems that involve everything from intuition and different ways of knowing, like knowing through dreaming, knowing through proper asking, and observing, and recognizing that, again, we are in relation to other nations. To plant nations, to water nations, to animal nations. "You need a minimum of this." Right? But then we conveniently use, or in terms of settler colonialism, the settlers use the one drop rule to say, "Well, if you've got one drop of black or African descent, then you now are Black." So it's these arbitrary rules again that mathematics, I think, can support by creating these binaries, rather than suggesting that things are a lot messier than they are. I think Indigenous knowings also never separate ethics from moving through the world. So when I think about what are the limitations currently in mathematics education? When we look at the STEM fields, and we look at mathematics in particular, we get to a point where we then tell people, "Okay, now you need to think about the ethical implications of the mathematics that you may do." So people like Kathy O'Neill have written about weapons of mass destruction, right? How we use algorithms in society in ways that are dehumanizing. We know historically that mathematics has traditional supported warfare and economics, so how do we think about those ethical principles? Well, in indigenous knowings that's part of systems thinking. There's no, "You now have to add on ethics." It's part of it. So there's all these things that have been stripped out; ceremony, and religion, and other ways of knowing, intuition. Intuition's another one that, again, we have ways of communicating with the physical and spiritual worlds that are not acknowledged in mathematics classrooms, at least in the United States. So there's no place for spirituality in a math classroom. There's no place for honoring and doing things in a proper way, because there's supposed to be this preparation of anything spiritual from doing mathematics. I mean, shoot, many people would say culture's not even part of mathematics, it's all objective. "Two plus two is four, no matter where you go." That's what I hear from people who want to make their arguments against me, but two plus two is four is a very, very limited version of what mathematics is, and that's again, what we're trying to think about bringing back. The complexity, the beauty, the joy in mathematics that we just don't see in schools. I don't know if I answered at all what you asked me. RG: Come down, come visit. I'm teaching a course right now that's called The Sociopolitical Perspectives in Mathematics and Science. RG: I have people in my class who are PhDs in physics, PhDs in mathematics, people who are doing their masters degree in mathematics education, or science education. I have people who are practicing teachers, I have people who are pre service teachers, we have third grade teachers. RG: Everybody's in that class, and we talk about all these issues, and we apply my Abuela Rule, which is basically "Anything that you say has to be understandable to my abuela." And that's not because my abuela's dumb, but because she's so important and she has so much wisdom [crosstalk 00:34:23] from time [crosstalk 00:34:27]. AD: I'm going to take on that role. RG: Absolutely. Use the abuela rule, that's what I use. But so the physicist has to be able to explain something to another physicist, but it also has to be understandable to the third grade teacher, and that's not because it's going to be watered down, but it's not useful, and it's a form of further colonizing when we expect people to only come to our way of viewing the world, only come to our way of speaking about the world. So, I'm sorry, your welcome at any time to come visit a class. LS: Yeah, listen, I would love to. I'm a full time teacher, so I'll have to come on a break and hopefully you're not on break when that happens. AD: We can make that happen. LS: But yeah, the question I wanted to ask is, and it's something that we go back and forth, is what word do we use when we say science? Sometimes we're like, "Okay, western science for science." LS: Or Western Modern Science, and in this redefining and trying to deconstruct and break these things down, how important are words and language, and meaning that we give? So when we redefine it, do we call it something other than math? But then we've seen that happen with science and Indigenous knowledges, but indigenous knowledges doesn't get the same validity and importance placed on it as when it's labeled as 'science'. So, that's something that we've struggled with, and so I'm wondering if you can maybe speak about that, around this terminology that gets used when we're doing this type of work? RG: Yeah, I mean I could talk for hours about this, because my graduate students know, I am a real stickler on language. Words mean a lot to me, and I think hard when I write. You'll see, I always have a million footnotes. Why do I use this word? Why do I not use that word? Why is this word part of this thing? And how is it connected to how other people use that word? Why am I using ... So it's something that I also grapple with. I just got done writing another followup paper to The Living Mathematx, and I grappled in that paper with do I use Eurocentric? Do I use global north? Because there's distinctions too when you say western, are you talking about Europe? Like even if we say, "In the west," and we're talking about are you talking about north or south? And how that works out. When I say modern, I say modern to mean modern as in day, like modern mathematics, I'm not saying it as in modern contrast to primitive, and I think that a lot of people think of it in that way. Right now what I've been doing in the last paper that I wrote is interchanging western and Eurocentric, I sometimes use white stream when I write, that also becomes part of that same word. I think what we have to do though is that we have to start naming the other stuff. So, we can't keep using words like mathematics, we have to say Eurocentric mathematics, or western mathematics. So I have a graduate of mine who went on to teach in Berkeley, and she renamed a course of hers. The course was called Geometry, and she said, "I can't teach this course called Geometry," she said, "It's really Western Euclidean Geometry. It's one of many geometries I could be teaching, but the students need to know." So that small act of naming it. What happens is that when we don't add these other words, when we don't say, "This is Eurocentric science," and we instead say, "This is traditional ecological knowledge," which I don't like that word traditional either, because it makes people seem as if there's so people who are traditional, static, that stuff is old. You know, was once discovered, and they're still using it, whereas the rest of us have moved on. We're not traditional anymore. So what we have to do is that as we have terms, I think we have to not just have terms that are trying to name the things we want, but we need to call out ways in which we are naming that continues to normalize something as the standard by which we're judging everything else. So when we just say "mathematics" and we don't say "European mathematics" or "Western mathematics" or "modern Western mathematics" we basically are implying that that's what we mean, right? In the same way as when we say, "Oh, American." We don't necessarily mean black American, we don't necessarily mean Mexican American. People think American and they think European American, but we don't call it European American, we just say, "American." And even when we use that word American, we really should use United States, because it's not American, and it's not even North American. So I think trying to be as specific as we can, in the same way that there's times where we want to say, "students of color" or "people of color" for solidarity, but I think as we get into studies we want to try to be as specific as we can and not gloss over things. So for me, I think we need to always be calling out when those things are, whether we're talking about "heteronormative" something, rather than just calling it the thing. So I think we need to call into question, not just the words we're coming up with, but call other people out when they just say "mathematics." I think we always need to be saying, "Well, which mathematics are you talking about? Because there's many mathematics that are practiced around the world." So when use that word ethnomathematics and we juxtapose it with mathematics, we're already doing the very thing that is perpetuating the idea that one thing is the true thing and the other thing is like, "We'll also include that." As a second cousin type of thing. But we're also making it seem as if the two are not overlapping, when we know they are. whose ideas are these. When we say, "Fibonacci," they hear Italian, right? When in India they're called Hemachandra numbers, or Virahanka numbers, because those numbers actually come from Sanskrit poetry that was written in 600 AD, and those numbers were understood by linguists. So people who we wouldn't even consider mathematicians. These were written down in 600 AD, like a thousand years before Fibonacci was even living. So all of those namings are important, because when we call someone out and say, "Oh yeah, you're talking about Hemachandra numbers," or "You're talking about what Kingala discovered," or "You're talking about ... " Then we're able to say, "You don't get to name this as only this thing, because it was being practiced in many parts of the world, and by people earlier than other people." LS: That was super. Super rich to think about the history, just in that act of placing and historicizing I guess, ideas in that same way. RG: The other thing that we need to do is we need to decenter humans. I mean the fact that we call these Fibonacci numbers, or Hemachandra numbers, when we could be saying, "Well, there are plants that have been performing these numbers for us for millennia." We don't give those names to the plants, we don't give them to pine cones, we don't give it to pineapples, we don't give it to nautilus shells. So we talk about things as The Golden Ratio, and then who came up with that. LS: So I think that I could talk to you for hours, and hours, and hours. I have one, I don't know if this'll be our last question, but a question that I think circles back to one of the first points that you made, and you talked about math as having this unearned privilege, and it is because it is, and we don't question it. So, I wonder if you could talk about your journey to even start questioning it? Yeah, that is my question. How did you exit the matrix of this mathematics to begin to develop these ideas and put these things forward? RG: I don't know. I have a degree in biology. I come from kind of outside. I don't have a degree in mathematics, although I get invited to many conferences of mathematicians, people seem to think I have something to say. I've had to be a learner of all of this. I've had to learn the history of mathematics, I've had to learn ... I was good at mathematics as a kid. I was kind of a geeky math kid, I always loved puzzles, to this day I love, I'm a board game geek. I had a math club, bilingual math club that I ran out of the library for three years, where I just helped middle school kids. We did college level mathematics with middle school kids, and played all these games as well, and you had to use the body, and you had to do things in teams, there was nothing you could ever figure out by yourself. So I love puzzles, I love an analytic way of thinking about things that I think mathematics supports, but I also know that having been raised in an activist family, it didn't fulfill me to just continue to keep doing more mathematics. I would tutor other kids in mathematics, I taught mathematics in middle school and high school, but I felt that something was missing, and I think it was that sense of feeling like there was something that wasn't complete that made me question what else could be part of this maybe, and there was a point in time when I asked myself, "Maybe I should go back and get a math degree? Maybe this will help me better be able to speak to people about these things." Help me better be able to speak to people about these things. You know my husband was supportive and I was getting ready to sign up and think about, okay I go do a masters in mathematics. I could do it here at the University of Illinois and sit in classes. And I realized that the very things that I would learn in those classes would just be a credentialing. It would just somehow serve to signal to other people that I was mathematical. And I didn't ... Realized I didn't need that. That actually wasn't gonna help me investigate and be a better learner of mathematics. What was gonna help me was to actually go out and read histories of mathematics. And a lot of it is really understanding historically where have we come from. And so I guess that's the part that helps remind me that a lot has been erased. We've made decisions along the way in terms of modern mathematics about what to privilege and what not to privilege. I guess if you don't understand where you've come from, you can't have a path forward for knowing where you're going. Or how you would want things to be different. I think of it a lot as right now when I'm working with pre-service teachers, I help them understand the whole history of mathematics education reforms. And we go back to the 1989 curriculum evaluation standards and we talk about where was the National Council of Teachers of Mathematics with respect to equity back then. And then you know with the 2000 standards and the 2008 position statement on equity. And we marched through all these things and we say, "Now we're at common core. And we have these practice standards." But there was all this stuff that came before you and you didn't used to pay $300 to Pearson for your Ed TPA to become a teacher. Teaching is a totally different thing right now and they're shocked by that. But it's like if you don't have all that background to know that things were different, it's really hard to critique what currently is. 'Cause you just don't see that it could be otherwise. Again, it looks like well, these really smart people who are mathematicians are telling me that there's these [Fibanocci 00:46:05] sequences in pine cones and music and plants and whatever. It's just like it's encoded like it's somehow dropped down from above as this thing that just deserves its place in society. But we could say the same thing about whiteness. I mean whiteness operates with unearned privilege in society. And I think that historians and critical scholars that helped us understand that better. But it's always a ... I don't know, I feel like I'm still on this journey. I'm still trying to figure out how to radically re-imagine this. I was critiqued last year. I came under the assault of the outright last year when I published a piece. And they came after me for suggesting that ... Well I had said that very term, mathematics operates as whiteness. They, Fox News went viral with and said that I was basically claiming that teaching mathematics is racist. RG: Well the status quo. AD: This is such powerful work that you're engaging in and you really provided so much for me to think about. I'm sure [crosstalk 00:47:40] we're taking so many notes as we're speaking with you. 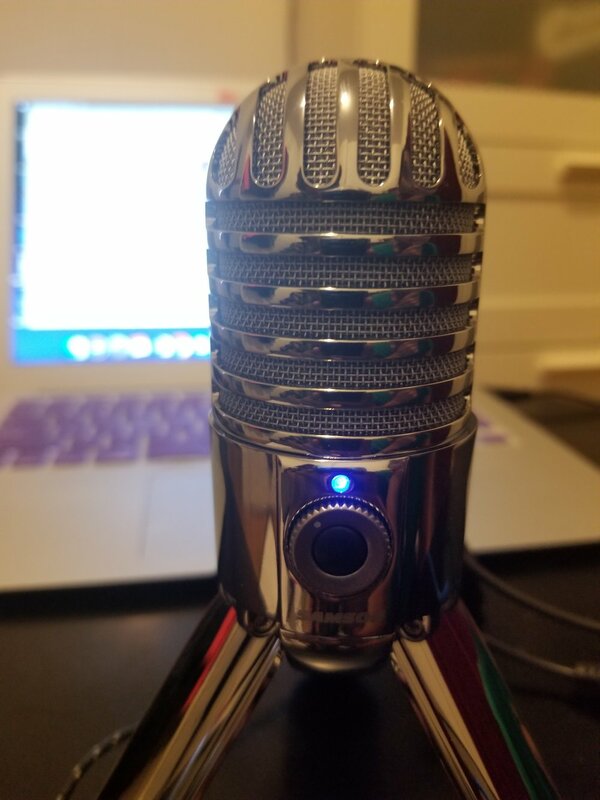 Are there any other probably wrapping up final thoughts or words that you would like to share so our listeners all over and of different kinds, we've met some listeners. But we don't know everybody, but some are educators, some are researchers. If you were to ... If you have any final words or thoughts. RG: I think one of the things to do is to think about how you can get educated about these ideas. How can you start deconstructing what seems like it's normal to think of it as potentially abnormal? I think being able to look around appreciate all of the mathematical things we do in a given day is one thing. An exercise I've been doing with students is actually asking them to stop and name what feels dehumanizing about mathematics and mathematics classrooms in particular. And in part of that naming in the dehumanization is creating solidarity and helping recognize that there's a lot of us that are goin through this. There's many people who have this you know it affects you longer into your life when somebody thinks of themselves as mathematical or not mathematical. Some of it is just in the telling of stories. When do you first remember doing something mathematical? And somebody explaining who were you with, what was that like? And what, you know people will tell a lot of ... Unfortunately when I ask that question of people, a lot of times people have a lot of horror stories to tell. But I think in some ways it's ... I don't really wanna liken this to the #MeToo movement, but I think we need to honor our stories. And we need to be able to talk about the trauma and the violence that's happening to people. I mean if we are all sitting there and being complicit with well, I guess this is normal, that that's how it gets perpetuated. How do we find ourselves in conversation to call it out? To say, "You know what was really dehumanizing for me in mathematics, when my teacher said this or did this. Or when no one else backed me when I said this thing. Or you know I once went and tried to do this and then somebody, I was making the tip at dinner or something. And then somebody laughed 'cause I had to use a calculator. Or you know it's in naming all those things and calling them out as why do people feel bad. I mean I think about you know one of the greatest erasures at a very young age is when we are taught to feel shame for using our fingers to count. RG: And you think of that as very young children learn very very early to put their hands under the desk and to count on their fingers. When these are manipulatives. These are things we carry with us on an everyday basis. And if they work for you, why wouldn't we want people to use them right? It's being able to name those things and go, "Yeah, that is a really rational thing to do to count on your fingers if that works." And what was it about school that made me erase that so quickly that I wasn't able to transition into other forums? Because I was made to feel ashamed rather than, that's a really good working tool for now. "Yeah, well that makes sense for you to have felt that way because it was very natural to do things in the way you were doing them. And then school said you could only show your work in this way." Or other people expect it, well that's not math 'cause it's not numbers. But actually there's a lot of really interesting things people do that could be considered mathematics. AD: Yeah I feel like I wanna do that with my math class coming up. LS: You should do it. AD: I'm gonna. I think I'm gonna. Well thanks again for joining us. I think we have so many wonderful things to take away and continue in this journey to rethink of science and math. I just wanted to thank you so much. RG: Yes, thank you for having me and thank you for coming up with the awesome idea of doing Abolition Science and creating a podcast. And making it available the people because this is the way we move the conversation forward. And this is how we create a community and this is how we radically re-imagine what we want for ourselves. AD: Yeah, we hope to. Yeah. AD: at an academic conference. AD: For folks who don't know. LS: Thank you for just being so approachable and available and willing to speak to us. We yeah, just really appreciate it. RG: Okay, have a great rest of your evening. AD: You too, take care. AD: You just heard a clip from the artist Dr. Gutierrez mentioned. The artist being Zeshan B and him performing along with this band ‘Crying in The Streets’. This song was originally written and performed by George Perkins, a Black American Soul Singer from Louisiana. And the song came out of his observation of Martin Luther King Junior's funeral after his assassination. LS: This isn't the song that Professor Gutierrez recommended, so Atasi can you tell us why you chose this song? LS: In lieu of that one. AD: Yeah, so the song that Dr. Gutierrez did mentioned was called Brown Power. And I was searching, searching for it and I was just not able to find that song. But I looked up some of what it was about and just as the name alludes, it's about solidarity amongst people of Color. I was looking through some of his work and found this piece Crying in The Streets. Which seemed to be in the same vein of that particular theme of solidarity. What are your thoughts about the song in general? LS: I mean I think it's good for what it is. If I'm gonna listen to soul, then I'm gonna listen to soul. There's the song which we listen to and then we watch the YouTube or the video, we watched the video on YouTube. And I think it does, the song on its own and Zeshan B's video does different things. I think for me there are moments in the video where he, I mean there's people marching. He's showing different movements, but also different point and pieces of oppression, and oppression and there is ... Specifically there's the clip of Eric Garner but it doesn't actually go all the way through. It's the beginning clip but you know what it is. And for me just this recirculation of Black death is ... I don't see the point of it. And I think specifically for Black people, not just the United States, but just across the globe. It's like we know this is happening and thinking about what is the purpose of re-circulation? Who's re-circling in it and why? Then also, okay follow me. Keep going with me here Atasi, the thread. AD: Yeah, yeah you’re good. LS: And then thinking about this rehumanizing math and science I think it's like okay we've re-documented these things. This Euro-centric White Western way of doing things isn't working for these students. And it also, it's helping to reproduce the inequities and the oppression that we see. The way that we take it up. And the same way it's like, okay we've documented these things. And so how ... I'm not a musician, so there might be musicians are listening like please stop talking about this. How do we if we're doing Radical or social justice music? How do we rehumanize it in a way in which math and science is being rehumanized to actually center the people who are here in the US? You know we different populations and different places. This perpetuation of oppression and repression or any inequity. AD: Yeah, wow, there's so many things that what you're bringing up makes me think about. And it's like you know there is ways in which when we talk about movements or we talk about symbols. And we talk about ways to think about the state of the world. State of communities, particular communities. I'm thinking of the word consumption, things that help us interrogate our own positionality. Like disruption and solidarity. Those are four different kind of words, but the way that I'm thinking about how do we do that? How do we go about disrupting the status of what is happening at this moment? Not that it does not need to persist right? Incredible amounts of oppression that are happening too in Black communities with Palestinians wherever it is happening right? How does that disruption look like? LS: So many that we can use. Like do you have to go through this? Okay, we buy into it. It doesn't work, but what is the process? LS: Did or what we thought we were doing, so I guess that's my question. Is it always have to be this long process? I don't know. AD: You're talking about do we have to do this again? Yeah, we agree that something's wrong, but then I'm thinking the use of Che Guevara's face that's implanted on shirts, bags, everywhere. It's like this weird symbolizing, but the symbolizing is almost tokenized in a sense right? It's like you're like there's somewhat of an acknowledgement and then how do we deepen that? We really have to shake everything up. Someone had once told me and was like, "It's hard to undo kind of what you've already been so struck, you know like attuned to. Like it takes incredible amount of work to constantly be vigilant to like, wait, what am I doing? For what purpose?" And so you know we'll make mistakes. We're gonna make mistakes and we have to look at it and then keep going. But yeah, I was thinking of Che shirts. I was like, "Che shirts are everywhere." Or like you know that symbol is supposed to mean something but does not, doesn't always evoke the actions that mean that thing. You know? I don't know, that's what came up for me. AD: Harry Potter has seemed to make his way into this conversation, interesting. LS: Yeah I guess I know the ... In listening to you I feel like I know the answer to my own question. And I think things would be different if folks didn't have to go through this journey. AD: Yeah, so where do we move from here? I mean we know I think in our, LaToya in our conversation and with our audience in the Internets, what does that mean for us and our practice? We're trying to rehumanize our engagements, our practices of using music of you know, of thinking of math and science. What do we do now? Now what? LS: I think that is the point, but just being thankful for Professor Gutierrez for putting this out there like here's where I am. And it's shift, it shifts how you approach and how you think about it. And just we need more, we need more of in her work. AD: Yeah, absolutely that journey is great to make for folks who make it apparent, like hey I've changed. And to make clear that hey we're all changing, we just have to ... And sometimes make it actual change. LS: And we have reached the end of our episode. We really hope you enjoyed hearing Dr. Gutierrez who just is dope. LS: And not only is this the end of our episode, this is also the end of our Season 1. Which I don't really know what a season means for us. It's the end of it. AD: It's the end of it. AD: You guys are great, everybody. AD: Yeah, in the vein of what you were just saying of thanks, we wanted to just really take some time to actually shout out folks from Instagram and Twitter and also Facebook. So, next time we're on the air we'll just say a quick thank you 'cause we appreciate your engagement with us. 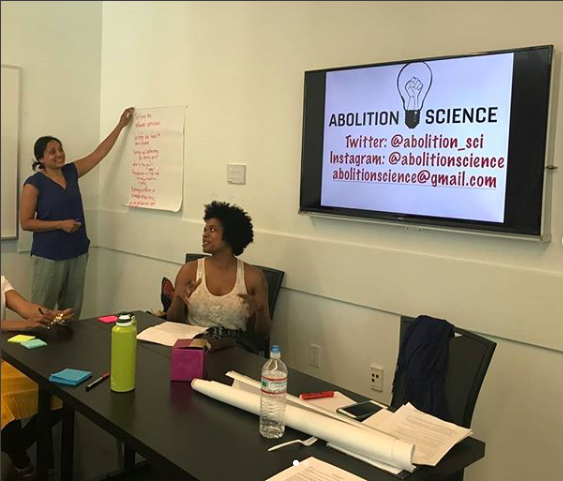 Don't forget that you can find us on Instagram @Abolitionscience or Abolitionscience and on Twitter as well as our website, abolitionscience.org. We'll see you next time. Oct 30 Who are the Free Radicals Collective? Oct 23 Reprise: What is abolition science ?